Well, something about summer makes me a lazy blogger. Probably because there are other things I would rather be doing than sitting at the computer! But I do miss it a little bit, so here is an update on our fun and crazy summer that is winding to a close all too rapidly! The first big event of summer was Girls Camp. I didn't really get any good pictures from that, but it was really fun. It rained almost the whole time, but the girls were such good sports, and we had a gigantic car port tent thing that we could all huddle under and eat treats together. What more could you want? It was so fun! I love my ward. We have such a good group. 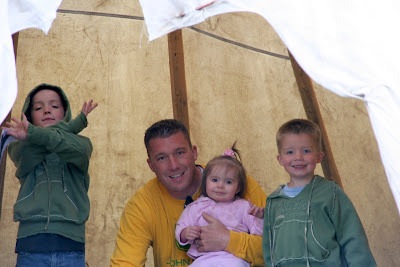 The week after Girls Camp our family took a trip to Yellowstone in our new trailer. It was a great trip and so much fun to be together and carry our house on our back like a pack of turtles. Who all share the same shell. At least that's what it felt like. There's nothing like being able to pull off to the side of the road and "camp" by a city park and use their amenities so you don't have to stink up your own bathroom. Ha ha. 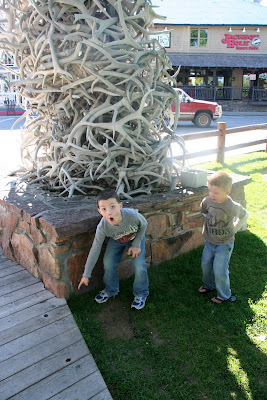 We actually only did that once, in Jackson, WY. 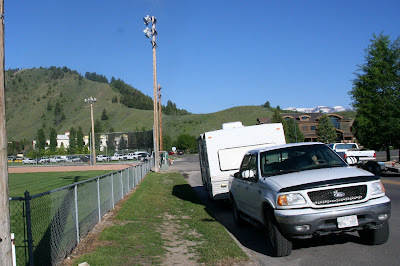 They have very nice facilities near the baseball park, if you want to make a note to yourself. Abby did so well on the trip. I knew the boys would be fine, but a toddler who has just learned to walk is always a bit of a... challenge, especially on long road trips. 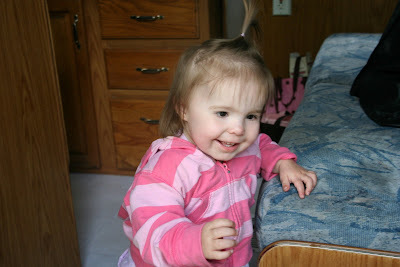 She loved the trailer and settled right down every night in her pack-n-play and slept till morning. Whew! 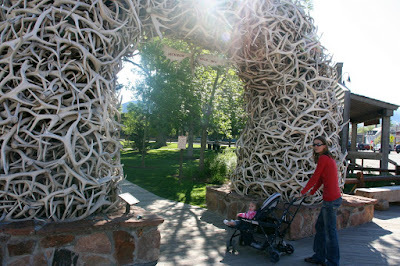 The big antler arches are always a fun stop in Jackson. 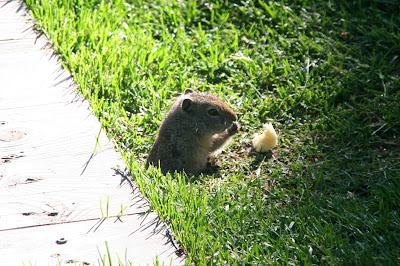 But the boys spent the whole time chasing small rodents and feeding them bananas. This little guy probably had the worst tummy ache later. He ate several. 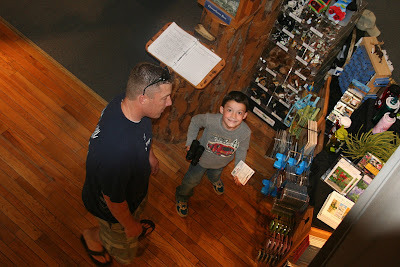 Jackson has a great visitor center, where Dallin started his souvenir collection, courtesy of Jason. He's a nice parent. I, on the other hand, am not. Abby loved running around everywhere we went. She is such a funny little drunken sailor! 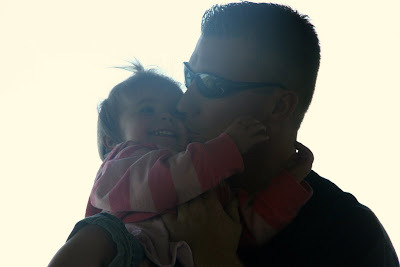 She still loves her daddy! 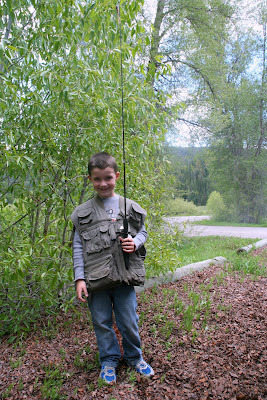 What is a trip with Jason without a few little fishing stops along the way? Jason, Dallin and Luke had so much fun, and Abby and I had a great nap in the trailer. 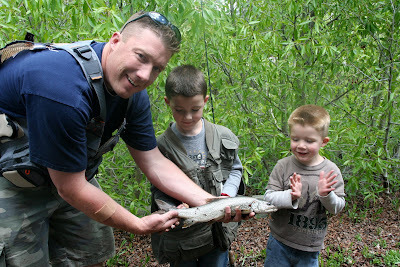 Fish away, boys! Take your time. 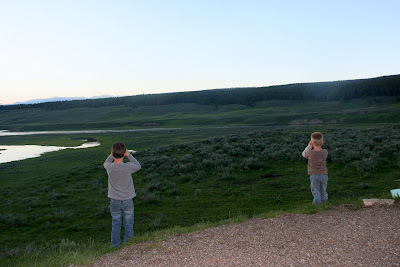 Once in Yellowstone, we saw tons of animals (I'll spare you the pics). 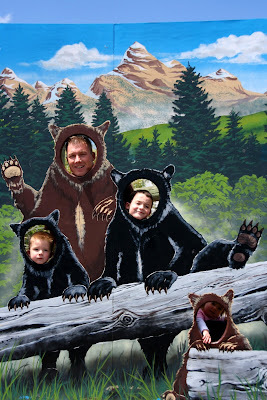 The most fun was all the grizzly bears. We saw five! I don't know what the boys are looking for in this picture. They probably don't, either. The first buffalo you see in Yellowstone is exciting. The 400,000th buffalo... not so much. Luke still wanted to pet him, though. 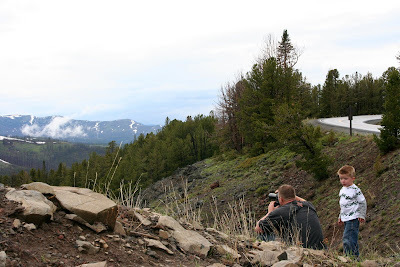 Jason prides himself on spotting animals and being the first one to start a "commotion" (when about 75 cars pull off to the side of the road to see what everyone is looking at). I have to hand it to him, he is really good at it, and as a result the Yates family spends a lot of time doing exactly what you see in the picture below. Watching Daddy look through his spotting scope. I get a lot of reading done this way. Fishing Bridge is always a good time. 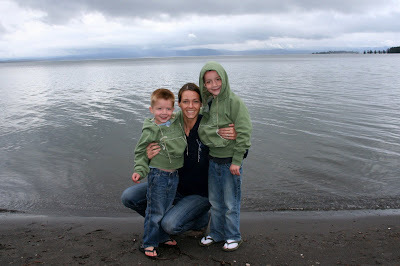 We camped for two nights at the RV park nearby. 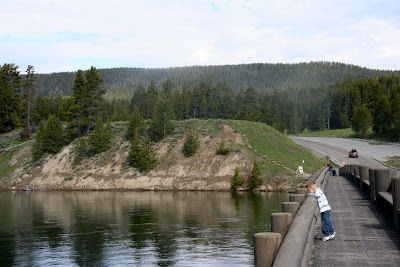 We also saw a grizzly bear roaming around right by the bridge one evening! Good thing we were on our way out. 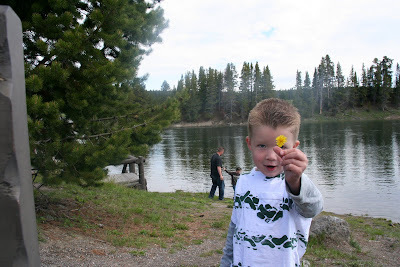 Lukie picks flowers for me wherever we go. 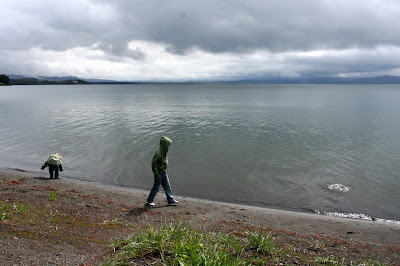 Dallin learned to skip rocks on this trip, which made for some fun little rest stops. 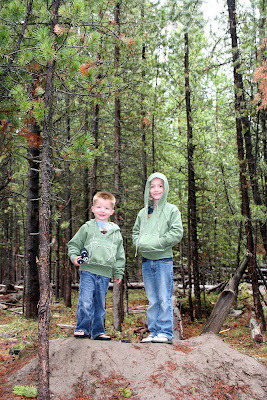 The boys in the woods. 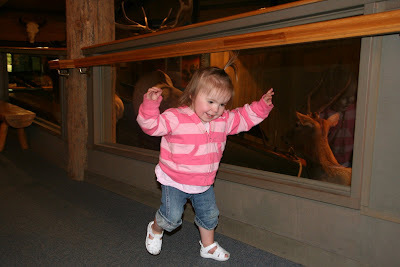 We also went to the Grizzly Discovery Center in West Yellowstone, and Bear World in Rexburg. It was a fun way to start the summer! And if I try to include any more of the summer's activities in one post, it is going to get really long, so TTYL, or whatever kids say these days. It looks like you guys had a great trip! You updated your blog? I'm shocked! Your trip looked like a blast. I'm jealous of your trailer. 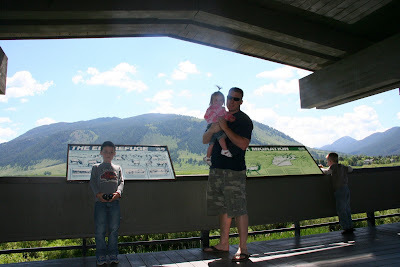 We loved Yellowstone!! We head up there in a couple weeks! We go with Gary's family every year.. It looks like you had a great time!! Fun pictures! looks like so much fun! I'm glad you updated us on the trip! The pics are so cute. How fun!! 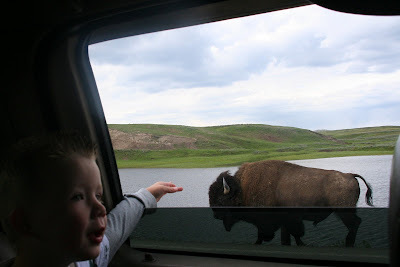 Im glad to see that you are alive.hee hee we leave for Yellowstone next week we cant wait.